It is time for me to get back into the swing of writing articles on the status of the property market in NZ. I thought that since it’s over 3 years since the last such analysis I would start with a bit of an overview and what better time than the close of the calendar year. 2017 could best be described in my view as a bit of a ‘steady’ year – certainly not the most dynamic, but then again not a particularly ‘frothy nor exuberant’ year. In this regard the pressure of an overheated market witnessed in 2015 and 2016 seems to have somewhat abated – not I should stress that heat gone away, simply that the pressure valve has been reduced somewhat. I like to starting any analysis with sales volumes, which in my view is the most important indicator. The volume of sales and to a lesser extent the pace of sales, reflect the confidence of property buyers and sellers to engage in the market. In the past year total residential sales look to be at the level of 74,500. A level almost identical to the recent years of 2012 and 2014, and fully 19% down on the recent heights of 2015 and 2016 which topped 90,400. Residential property sales have been falling (month vs month prior year) since June of last year, a consecutive run of 18 months. At that time the 12-month total of sales amounted to 94,631, this has fallen to a level in November of 74,187. That is a fall of 22%. However by analysing the variance trend, it can be seen that rate of decline is slowing and by early next year the trend is likely to be reversed and sales will show year-on-year rises. By then this decline will have represented the second longest consecutive run of falling sales since the turn of the century (the GFC period of May 2007 to Feb 2009 was 22 months of consecutive declines). That GFC period saw a significantly drop in property sales. Total annual sales dropped by close on 50% from 106,000 in the 12 months to May of 2007 to just 53,000 in the year to Feb 2009. 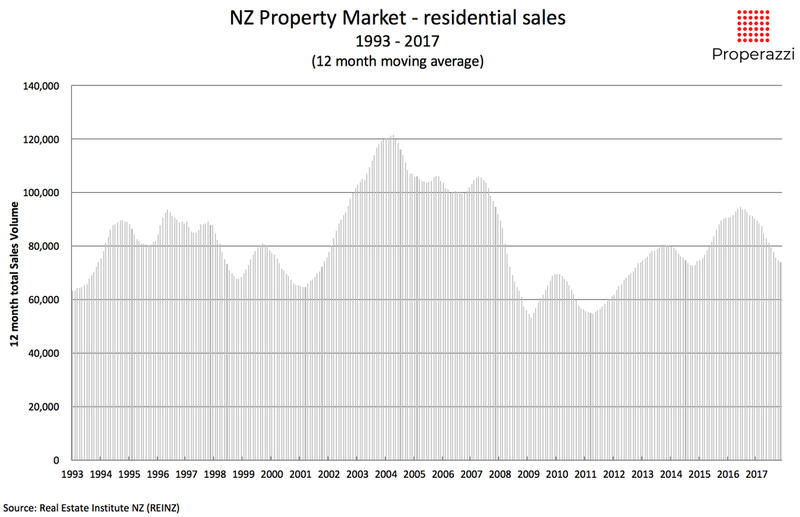 Whilst sales volumes are the best indicator of the state of the property market, there is an important denominator that needs to be considered when looking at time-series data, that is the number of actual residential dwellings in NZ over time. When the Real Estate Institute started collecting monthly sales data from agents back in 1992 there were around 1.2 million dwellings, speed forward to today that number is now over 1.6 million, an additional 400,000 new dwellings. This denominator therefore needs to be laid as a measuring rod against any comparative sales figures. The chart below tracks the residential sales figures over that period as a % of the dwellings in the country at the time to show what proportion sold each month as moving annual total. Over the past 24 years, the long term average rate is 5.8% of all residential dwellings are sold each year. At the very peak of the market back in the early years of this new century that rose to a peak of 8.5% in 2004, post GFC that figure slumped to just 3.5%, currently at this time we are sitting at around 4.5%. I have in this analysis kept to the volume of sales as the single data point, this I believe is key in analysing the market as price does tend to follow transaction levels, something I will explore in a future article. If one of the leading bankers of the world recognises the uncertainty inherent in forecasting, who am I to try to second guess as to the future of the NZ property market!